There was basic a check for updates already at compiler level (and it even was fixed recently). But it was providing information only to console. 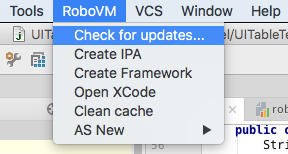 I’m working on automatic toolchain download functionality for Linux/Windows project and it requires version check functionality improvement. Here I describe basic version check that I will propose also for MobiVM current master (it does not contain any Linux/Windows specific parts here). Code was enhanced to allow high-level code above compiler to display user friendly dialogs instead of console output. In case there is no high level overrides (gradle case) there still will be old style console print. Now user can trigger version check at any moment. Also if balloon notification was closed this menu causes same update dialog. This dialog is triggered either by “check for update” menu click or by clicking on updates available balloon. It contains basic version information and button that will navigate to Download page. Important one is that plugin can detect updates for Snapshot builds which is often useful. beside this snapshot contains build.timestamp to be used to find out if currently used snapshot is outdated. lot of Idea UI changes to display version update dialogs/balloons.